It had been a while since we’d gallivanted, so Bear and I dragged the Dad Man out to Karachi Company at G9 while Mars was at her Arabic class. 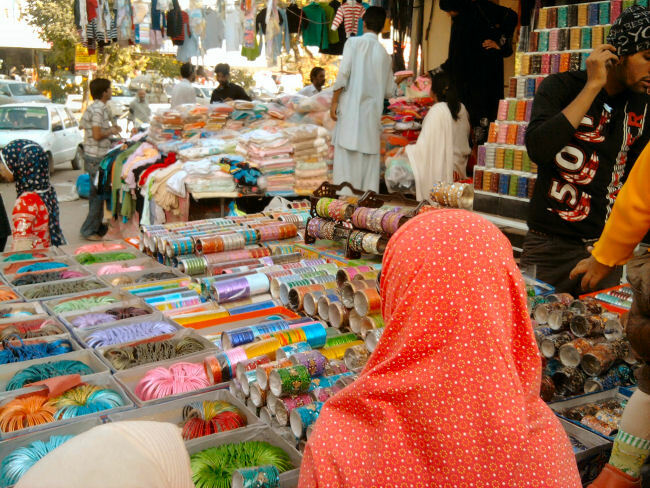 I’d always wondered why a market in Islamabad would be nicknamed Karachi Company. It turns out that back in 1978, a construction company from Karachi built the apartment complexes in that sector. 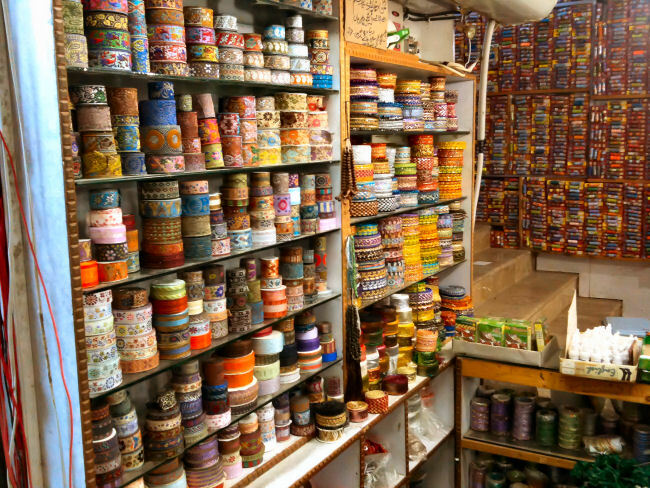 This is one section of the store – you can see shelves of lace and a bazillion threads all lined up against the wall. It is funny, but I have not been able to find cotton sewing threads. (I’ve been told that it is best to use cotton threads as it does not ‘eat’ into your fabrics.) This country produces cotton and most people I know prefer wearing cotton, but the sewing threads are all made from polyester. Here is another section of the shop, with even more lace and beads that can drive you to dizziness and distraction! These haberdasheries are known simply as “lace shops” here as it is essentially the lace that the womenfolk flock to them for. Practically everyone here wears the shalwar kameez and while there are boutiques that sell ready-made ones, most people get tailor-made ones, be they for everyday wear or special occasions. A great deal of effort goes into getting these outfits made – buying fabrics, designing the the outfits and choosing the trimmings. Sometimes ladies employ dyers to get their outfits and shawls to match *just so*. I’m often asked why I don’t wear the shalwar kameez. While I rather LIKE it and used to wear it on occasion, I find it all too bothersome (and costly!) to do all that shopping. In addition, the world of shalwar kameez fashion evolves constantly! While it may seem to outsiders that one outfit looks much like another, nothing could be farther from the truth. Trends change every season. Last winter, long, streamlined blouses were paired with straight cut pants. By summer, the blouses were even longer (almost ankle length) and voluminous and pants were cut even wider, palazzo-style. This winter, it looks like the churidar shalwars are in fashion – these are pants that are bunched up tightly along the lower calf. Even laces are subject to fashion trends – at one time, broad ribbons were popular, then heavy elaborate laces were in vogue… it’s all too much for me! My rowdy ruffians love clothes but they can tolerate only so much lace hunting :) They much prefer checking out knick-knacks at stalls like the one below. 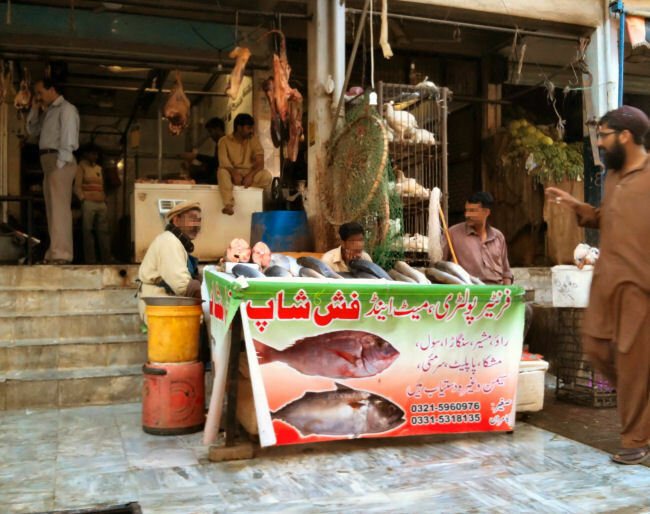 Here is a section of Karachi Company selling meat, poultry and fish. Back in Singapore, we had a good supply of fresh sea-food but in Islamabad, a more inland city, it isn’t as popular. Check out the man carrying the strange duster at the end of the stall – the stick with the long wispy ends. His job is to flick away the flies! Many store-owners own those witchy looking things – very useful to smack away pests and also dust. Round the corner, we saw a traditional medical hall. This shop reminded me of the Chinese sinseh in Singapore. 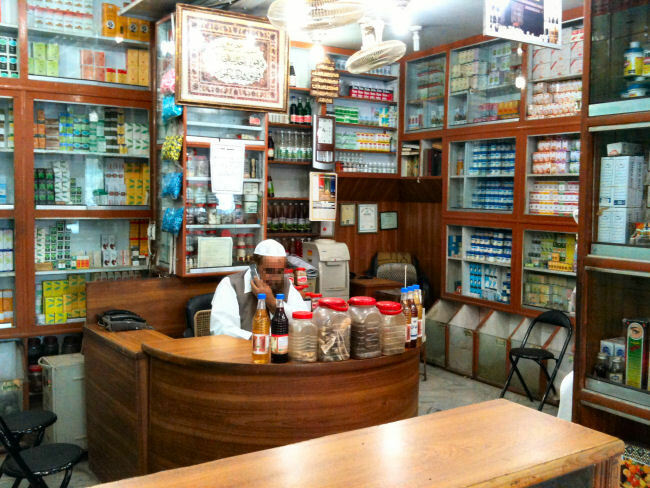 There is of course a strong Islamic tradition in Pakistan and so homeopathy, herbs and other remedies recommended by the Sunnah are very much in use here. 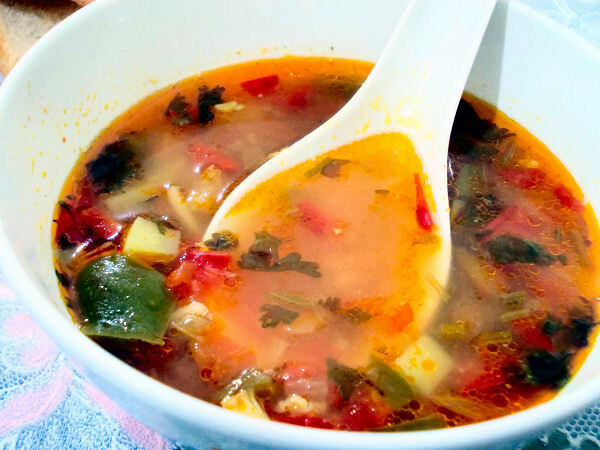 Most people who suffer coughs and colds will go for honey, ginger and the ubiquitous Joshanda! 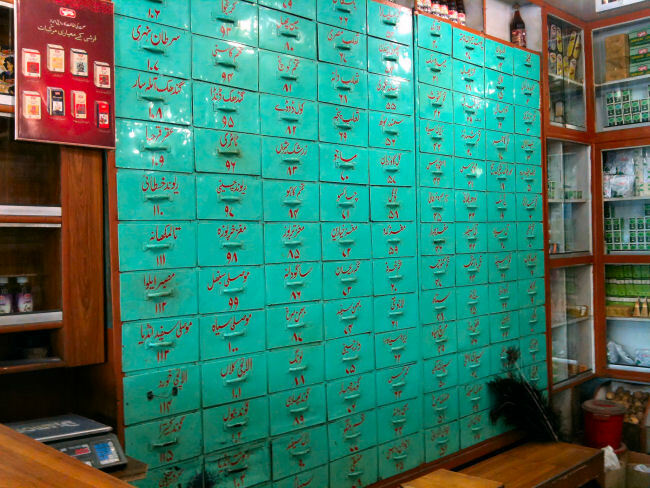 Drawers and drawers of herbal goodness. The head honcho surrounded by remedies. 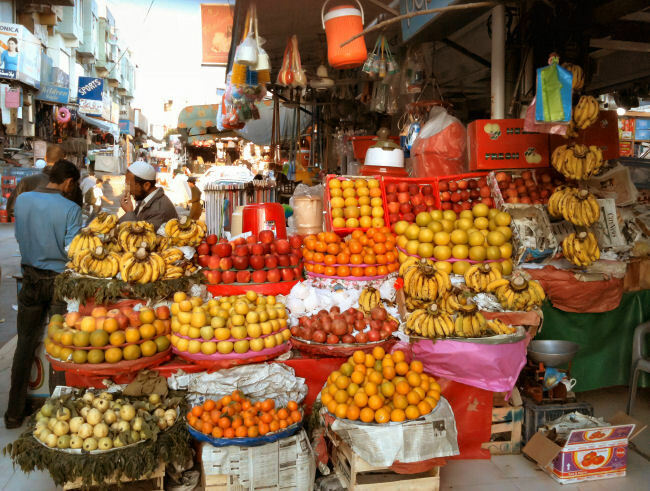 Then there are the fruit stalls… we don’t have a plethora of choice like in more developed countries. Supplies vary according to season, so you have to exercise some patience if you want mangoes in winter or oranges in summer. The fruits and vegetables here don’t look very pristine – they look quite small and brusied even at times, but trust me, their appearance belies their beautiful taste and flavour. It must be because the produce here isn’t chemically altered… pretty much organic! Oranges, pomegranates, bananas and guavas are pretty much standard winter fare. We have apples too but other than the imported Fuji apples which are quite pricey, most of the apples are not the crispy sort. I just make apple sauce out of them! 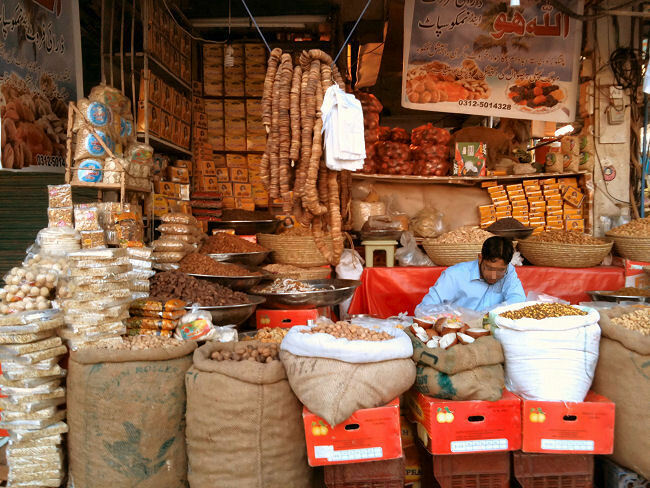 Dried fruits and nuts are also very popular snacks here. This vendor has raisins, dates, walnuts, almonds and peanuts that you buy by weight. He also sells packaged nuts that are encrusted with sugar and sesame. I love pine nuts – they are absolutely delicious, but a little more expensive. There are strings of dried figs at his store too, hanging by the rope if you look closely. When we got back to our car, we saw this vendor at the parking lot. 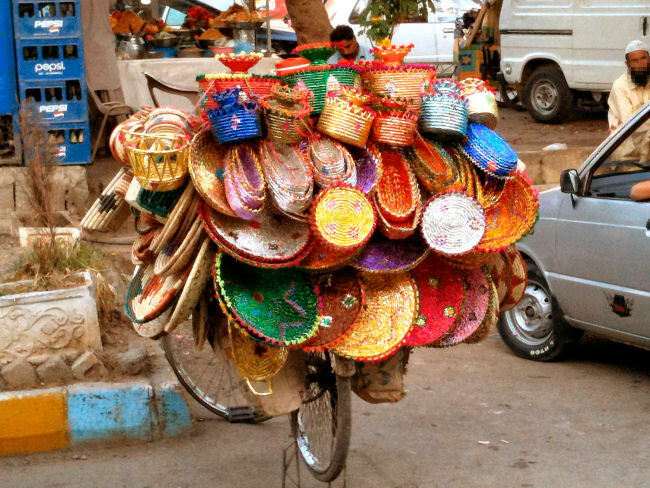 He doesn’t even have a stall – he just sells his wares right off his bike! He is the Pathan man in the white cap sitting a distance away. Bear was so taken by the woven baskets that she begged for a small one. The large flat tinselly ones are often used by fruit vendors I believe. Bear was eyeing the ones on the right – the beige ones with the brown designs. She eventually settled on a basket that came with a lid, which looks like one of these. They look a lot like the kind snake-charmers use! We just use them for our toys or needlework supplies. Just the other evening, the Dad Man, Bear and I were waiting in the car for Mars outside the Arabic Language Institute. While we were chatting, we heard a clatter outside and when we looked out the window, we realised it was the clip-clop of donkey’s hooves. Four donkeys and their riders were moving briskly on the road while cars were zooming along at rush hour. That, I suppose, sums up one of the nicest things about Pakistan – that the old manages to endure alongside the new. We also saw the man above with a round stone on his bike. 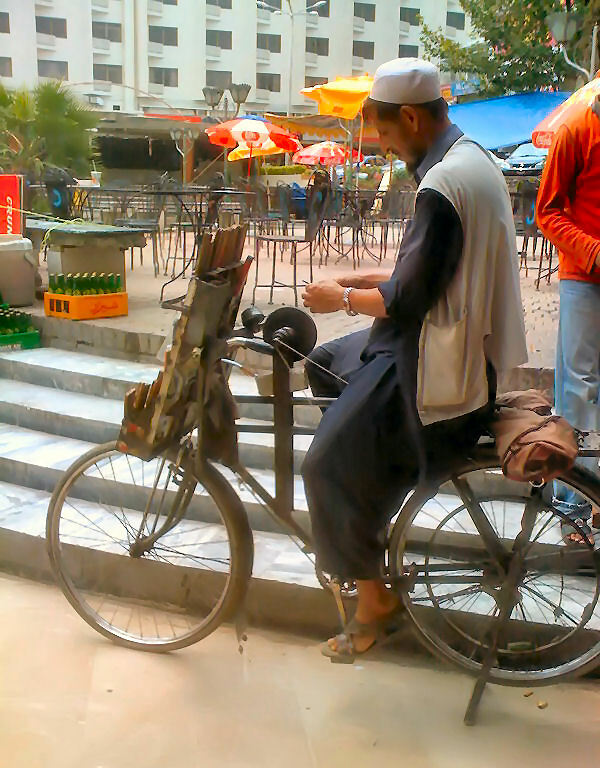 I wondered about the curious contraption and discovered he was a mobile knife sharpener! I believe the rear wheel of his bicycle whirls his grindstone. A dying trade no doubt in this era of disposables, more is the pity. 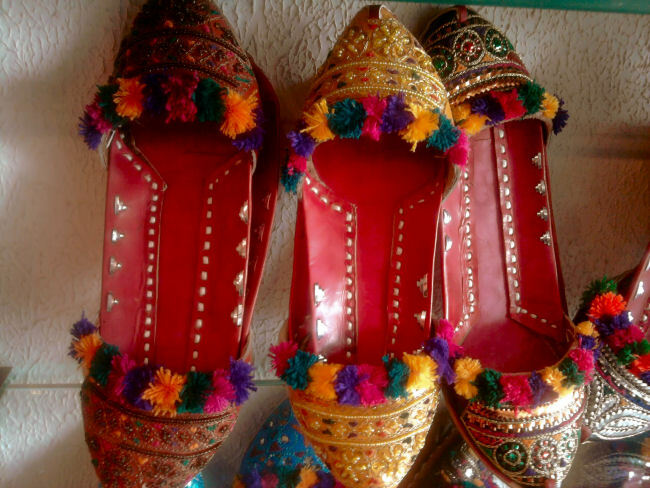 You will also find skilled workers like the embroiderers who do fancy thread and bead work on clothes. 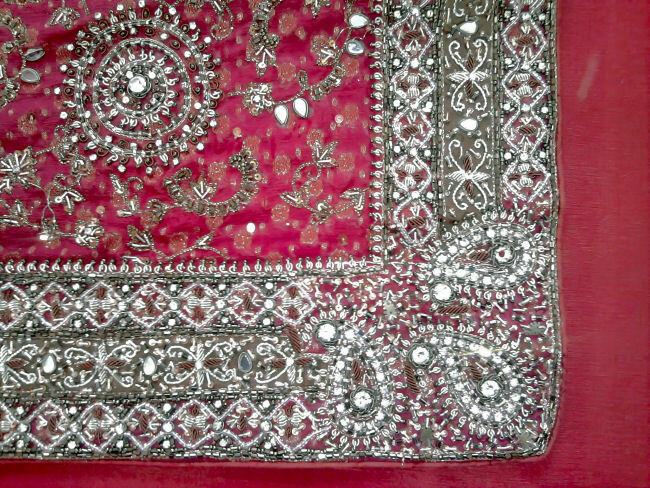 They still use traditional methods rather than use computerised sewing machines, so designs are detailed and unique. You can get simple designs to jazz up your casual wear or more intricate ones for formal outfits. Some do the embellishments on sewing machines after drawing out the patterns – now, these are free-motion embroidery machines so you can imagine the amount of control and work required. 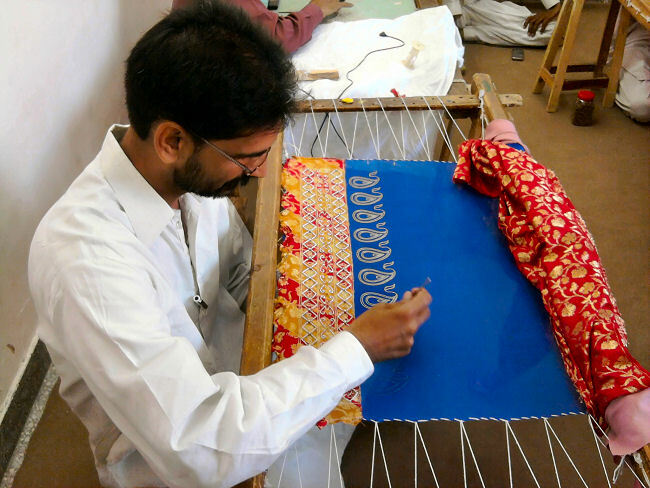 Others hand stitch their designs – the fabrics are stretched over a wooden rack and the embroiderer sits on the floor painstakingly working on each stitch and bead. A tailor with a family run business showed us samples of their company’s work. This is a piece they produced for a bride’s wedding dress. The photo doesn’t do the work justice – we had only a crummy cell phone to take the pic with! One of the tailor’s cousins who does all the beadwork and embroidery. Most of the tailors and embroiderers are men. I’ve met a few women who are accomplished embroiderers – they only stitch for pleasure. Commercial stitching and tailoring seems to be a strictly male domain. 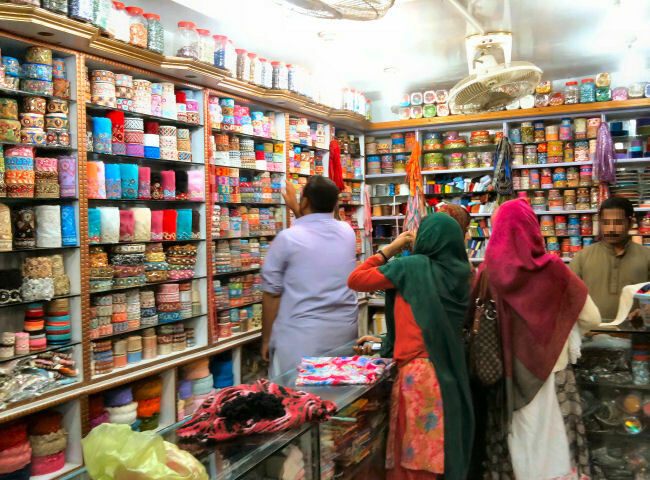 I have some recent photos I’ll post next in shaa Allah of a new favourite haunt of my children – Karachi Company – and some of the local snacks we like. Watch this space! We saw a row of women offering mehndi/henna services. 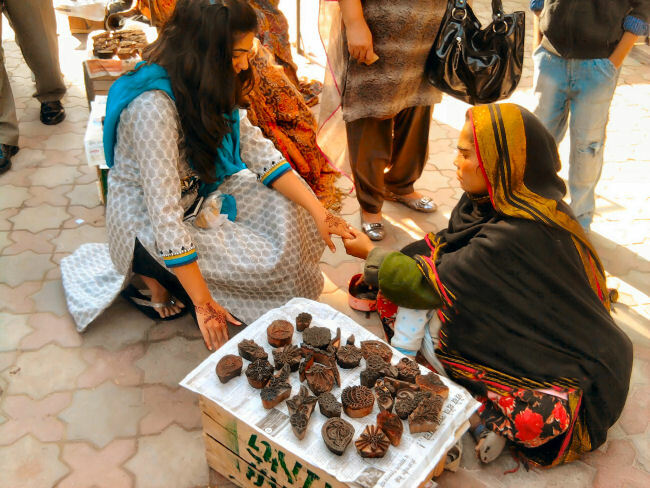 They sat on the ground with makeshift tables made out of boxes whereupon they placed their supply of henna and stamps. This lady has just stamped the girl’s hand with a design. Like the other henna ladies, she was poor and had a little baby that she was rocking to sleep under her shawl. 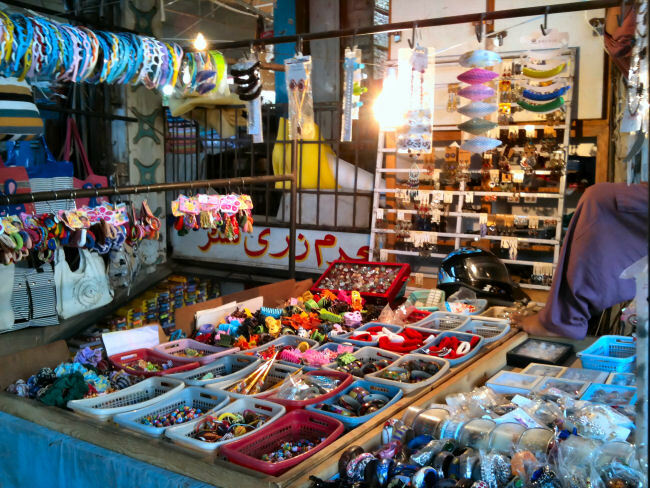 Just ahead of the henna stalls were the choori stalls – I had written about glass bangles before in an earlier post. 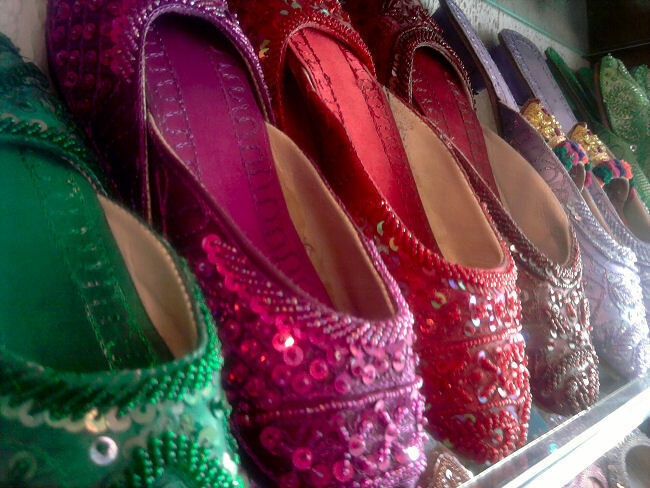 You can purchase them in various stores at any time of the year, but I think people have so much more fun buying them during `Eid when there are so many more stalls to choose from. Here are Mars and her sister (OK, Bear’s a little cut off :P) looking at the bangles. Just ahead is a stall selling children’s clothing – at Karachi Company, the clothes are much cheaper than elsewhere. You just have to have the stamina to fight the crowds and the stomach to tolerate the litter! 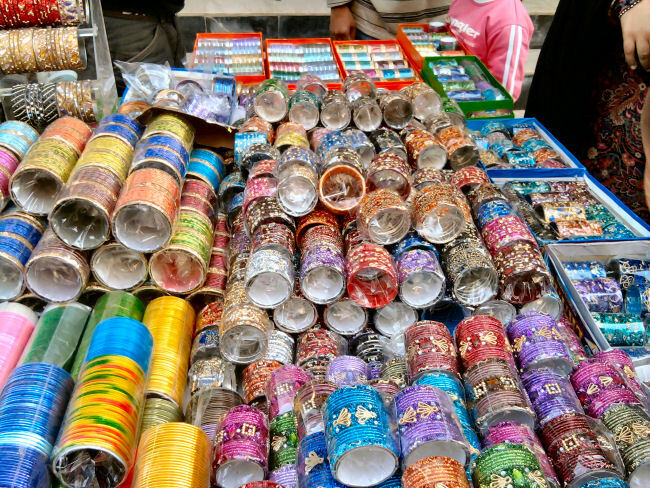 Another view of the bangles… they come in all sizes and colours. OK, these are a little too ethnic for my taste :P I threaten my kids that I’ll buy these for them if they don’t make up their minds quickly. Here are the shoes that Bear really likes – they are open at the back so they are easy for kids to wear. Matched with the right outfit, they look nice and swanky :) The soles are wooden so you’d have to get rubber ones fixed onto them to prevent slipping. Mars likes the open-toed sandals made of leather, which look nice with both traditional and modern wear, but I don’t have a pic of them.